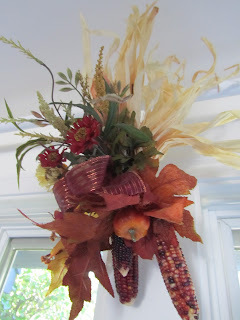 With autumn just around the corner for the northern hemisphere, I thought I'd show you a door hanging that I made with my garden club a couple of years ago. I happened to be in Michael's this afternoon and saw something quite close to it, selling for $19.99. I priced all the components today, and they would cost between $5 and $7, depending on where you shopped, and what supplies you already have at home. This is one bundle (3) of Indian corn (the grocery store today had a bundle of 3 corns selling for $2), 3 autumn-themed floral picks, one with leaves and a pumpkin, one with leaves and small berries, and one with autumn-toned flowers (dollar store for $2-3 or Michael's for 79c a pick, total about $2.50-$3.00), 1 wired ribbon folded in a bow, about 2/3 yard (dollar store, fabric store or craft store for about $1), a bit of florist's wire to hold it all together (about 25-50c). Our group spent about 10 minutes each assembling these. They required no special skill whatsoever. All of us were first-timers making these and they turned out nicely. 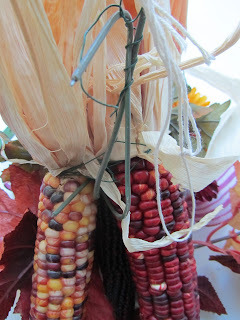 First we wrapped some florist wire around the necks of the 3 ears of corn, front to back, to secure them together. Then we pushed the decor picks up through the area where corn kernels meet husks, and bent wires down and wrapped the ends to the back, following up with one more length of florist wire to secure the bunch. (I placed my picks such that some would be under the ribbon and some would be above.) Finally, we added a wired-ribbon bow, held together by another wire, twisted and wrapped around to the back. Turning the ornament over, we made a loop out of some of the wire on the backside for a hanger. On mine, I added a bit of string to suspend the ornament from a hook or nail above. At the end of the autumn season, and beginning of the Christmas season, I put it away in a closet with other autumn decor. It still looks great, this being it's 3rd season. Do you decorate for the seasons, other than Christmas? I like autumn, so having decor specific to autumn seems like a natural to me. very nice. Good choice of picks. They fill it out very well and look great. I have three different painted wooden fall hangings for my front door. I got them on clearance several years ago at Target for about $2 each. I have had them for over ten years and they still look like new. They work well for my situation of hanging things between our front door and the storm door. We can hang things outside on the storm door but it is difficult. The hangings are not deep and survive the heat that is generated sometimes by the sun between the doors. Love it! Those finds at Target on clearance! Great deal on them. Post a photo on your blog sometime so we can see! That's awesome that even after 10 years they're looking great. Is it time yet, on your area to get out fall decor? I felt it was getting close to fall this morning when I went to make the coffee and had to turn on the lights for the first time this season. Thank you. I love it when I make something, then find a similar item priced double or triple what it cost me! I love fall, as well. The thought of it makes me want to get out my favorite sweater, build a fire in the fireplace, and make a cup of tea. But too soon for that I'm afraid! That look lovely. I have never understood why pre-made items at the craft stores cost so much it's ridiculous. Thank you. And our group had a fun time making them! I can't imagine paying a craft store to do this, and steal my fun from me. I enjoy the creative process. Hope your granddaughter enjoyed her surprise!